It's beginning to look a lot like Christmas here at Bluebird Farm in Virginia. I've been decorating the house and taking photos along the way. I hope you enjoy them. Merry Christmas! I love decorating my little farm house at Christmas time! Dogs of Christmas Past. This is a photo of my Dakota who passed away two years ago. She loved Christmas because she loved helping us rip all the wrapping paper off the Christmas gifts on Christmas morning. My beautiful dog Bailey just relaxing in the sun in my office as I decorate the house. The photo on the table is of my hunky sweet husband Chris with Miss Lexi. She has the kindest spirit in the world. God has truly blessed me with her sweet heart. I just love cute little dog ornaments throughout my Christmas tree. Miss Lexi with her raccoon toy just watching her mommy decorate for the holidays. She is so perfect! Self portrait in a ball! These two photos of Nitro playing in my ornament box were from last year when we adopted him from the City of Salem Animal Shelter. I love puppy photos and Nitro grew up so darn fast that I miss his puppy stage! Here he was last Christmas helping me decorate my white Christmas tree in the living room. Nitro is such a good boy! This year I went to the new Ollie's store in Salem and got this FABULOUS pink Christmas tree to put on my coffee bar. I ordered white feather boas to put on my pink and white Christmas trees. I think they turned out really nice with a soft texture to them. I decorated my pink tree with beautiful glittery Butterflies and dragonflies. The photo below is from last year. I couldn't resist adding this sweet photo of my two little girls Lexi and Tallulah. Here is a shot of the Pink Christmas Tree with the kitchen lights turned on. I think it is so girlie (eat your heart out Paris Hilton). Every year my sweet in-laws from Minnesota send us a Holmquist Pottery Christmas Plate. I love all of them but this is my favorite one with the kitty cat, the dog (looks like my late Dakota dog) and the Appaloosa horse. What a wonderful gift! This is my late Dog Matisse. She was the best little border collie mix farm dog ever! She loved helping everyone unwrap presents on Christmas morning. My sweet Nitro posing for the camera. We were doing a photo shoot for our Christmas Photo Contest on our sister blog Deaf Dogs Rock (Nitro is Deaf). More puppies on the Christmas tree. Beautiful photos, your house looks delightful. And that Nitro, he is still the most gorgeous pup ever. Oh my gosh! I'd never be brave enough to have so many decorations around my house... I'm imagining the multi-coloured and textured confetti that doggy mouths can create. I adore your little doggy ornaments on your Christmas tree. What a lovely post -the photos were gorgeous and so were the sentiments behind them. Your home looks very festive! Lovely photos! I can't wait to get started decorating. You've inspired me!! Beautiful decorations! I love the idea of multiple trees around the house. We love all of them and your photos are beautiful. Nitro sure has grown into a handsome one! awesome pictures...sure looks like Christmas over there. Very pretty! I love the pictures of Bailey in the chair, so serene. 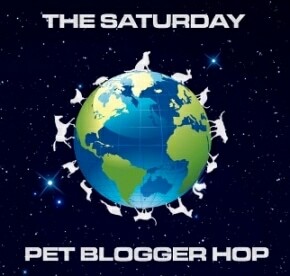 Stopping by from the Saturday Pet Blogger Hop! oh. i am in love with your pink girlie tree with the butterflies and dragonflies! Very heartwarming story at this holiday time. I just LOVE your photos. Your decorations look fabulous!